Would you want to leave for a greener pasture that offers a salary four times of your current one? In Dec. 2007, Samal was at Serangoon Plaza, a popular weekend gathering area for South Asian migrant workers, when he was approached and given a flyer that offered employment opportunities in Canada and Australia. The 33-year-old Blangadesh national, who has been working in Singapore as a construction worker for the past 10 years, then went up to Nilu’s Singapore Pte. Ltd to check out the offer. The basic salary is $25 Australian dollar an hour. Overtime rate is 1.5 times of the basic salary, while Saturday’s hourly rate is twice of the basic salary. On public holidays and Sunday, the rate is as high as three times of the basic salary. “They told me the pay could go up to A$4,000 easily a month,” Samal told TOC. He said that his current salary in Singapore is about $1,000 per month if he works for about 13 hours daily, seven days a week. On Dec. 9, 2007, Samal paid $500 Singapore dollar as his first-term payment. 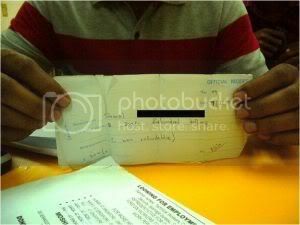 He showed TOC a generic receipt issued by the agency, Nilu’s Singapore Pte. Ltd. The receipt bore no company stamp on it. Samal was then told to go for a medical check-up, which cost him $149.80. Samal said that he paid the remaining $3,500 of processing money on Feb. 23. “They guaranteed [that] we will go [to] Australia in three months,” Samal said. Fellow Bangladesh construction worker, Mojammal, also faces the same predicament. The 36-year-old also claimed to pay $4,000 in total to the agency, only to find himself with a generic receipt and still stuck in Singapore. When they approached the agency six months after the second payment, hoping just to take back the $4,000 they paid, they were met with cold shoulders. Mojammal said that the agency had also suggested that he resign from his current job, terminate his work permit in Singapore and go back to Bangladesh first to wait for the Australian company to fetch him over. Samal and Mojammal are not the only ones who paid a lump sum of money for a broken dream. In Feb. 2009, six Bangladesh workers, including the duo, took the case to Small Claims Tribunal. The tribunal handles civil cases arising from a contract for the “provision of services”, with claim amount not exceeding $20,000. TOC visited the agency on Feb. 8, but it was closed. On Feb. 9, TOC managed to contact the agency for a comment. Sarjaj Singh, one of the directors of the agency, told TOC that they are “going through the proper channel” in handling this matter. “We have made a police report and everything will have to go through our lawyers,” he said. “Since this matter has gone to court, we cannot disclose [more] information,” he said. This is not the first time such a dispute has happened in Singapore. A. K. M. Mohsin, Chief Editor and CEO of Banglar Kantha, a Bangladeshi newspaper in Singapore, thinks that the six of them may just represent the tip of an iceberg. In the Sept-Oct 2008 issue of Banglar Kantha, he wrote about common scams such as recruiting agency taking huge amount of money from foreign workers with the fake promises of better opportunities overseas. He also estimated that there are about a hundred workers, including Bangladesh, India and Sri Lanka nationals who are in face of the same problems but do not know where to seek help. Meanwhile, Samal and company are paying off their debt of $4,000 which they have borrowed from moneylenders and friends. “I have to pay back [an additional of] $400 [of] interest every month,” Samal claimed. “I thought if the pay was good in Australia, [in] one or two months, I can pay all the money [borrowed],” Samal told TOC. When TOC asked Samal about his plans if he is unable to get back the money, he looked dejected. The second hearing at the Small Claims Tribunal is set on Feb. 27. Kelvin Tan is a Communications and New Media graduate of NUS. He was a journalist with prominent student newspaper, The Ridge.